We now continue our discussion of technology and the political arena. This chapter in particular is about the theoretical dimension of politics, i.e., how people have formulated the ideas behind our political system and how they interact with technology. We in the US and many other places exist within what is broadly known as the “liberal democratic tradition”. It can be defined succinctly as the intersection of the values of liberty, equality, and self-realization. More than anything else, liberal democracy wants to leave the question of the good life (what is it to live well as a human being?) open, because it believes the individual self must determine its own answer to that question. 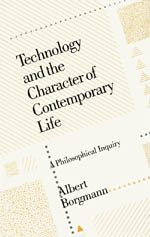 What Borgmann is concerned to argue here is that it is only the paradigm of technology which allows liberal democracy to achieve its three-fold aims, and thus technology becomes the hidden engine, pushing this political system forward while the system itself fails to acknowledge that, clothed in the tidings of liberal democracy or not, the pattern of technology comes with a concrete and definite vision of the good life. In other words, there is a deep contradiction in the heart of the theory: what it wants it can only get (via technology) at the cost of what it holds most dear. Echoes of this theorizing can be found as early as JS Mill: “The grand, leading principle…is the absolute and essential importance of human development in its richest diversity” (86). Since then, debates (between scholars like CB Macpherson and Ronald Dworkin) have focused on what constitutes this moral idea of “human development”. Is it that everyone is equally free to realize her potential? Is it some more positive form of opportunity? Ultimately, it has become clear that no agreement on that point is forthcoming. For Dworkin, this situation is to be expected, for “to arrogate the determination of the good life for others is to practice paternalism” (88). The responsibility of the theory is merely to provide justification for self-determination. This plays very conveniently into the multiplicity-of-ends philosophy that undergirds and is encouraged by the technological paradigm. And so we see that same paradigm at work in politics: electoral debates become about how to secure the conditions of the good life, not what that good life is. (Of course, some theorists are not content to provide space for self-determination and explicitly conform their theories to the promise of technology; “utopian democracy”, for example, aims to procure radical availability (precisely the promise of technology)—essential possessive equivalence, without a class structure). But in general, what we have is a theory of liberty (freedom, equality, and self-development) defined negatively, telling us purely what to do to create space for a theoretical infinitude of possible ends. And this (despite all the practical impossibilities around creating that kind of negative equality) is beginning to sound exactly like a system of devices. Moreover, it hides the deeper question: what is the nature of opportunities we say are essential for “equality”? There is a spectrum of answers here, and Borgmann names three points along it: first, we have the “constitutional” or “formally just” society, where society is given (in technical terms) freedom to pursue their own ends, but not the means by which to do it. Then we have the “fair” or “substantially just” society which provides freedom and some kind of means by which to pursue individual goals. Finally, we could think of a totally “good” society, which provides in addition to freedom and means a direction, a set of centering and orienting goals—a vision of the good. Borgmann then argues that it’s impossible in any of these types of theories to avoid the concept of goodness or centering/orienting goals. Even in the merely “constitutional” or “fair” society, the nature of opportunities is going to be present in some pattern, in some definite shape; in liberal democracy, that shape is the pattern of technology. But because this definite shaping is anathema to the spirit of liberal democracy, which aims to keep itself out of the good life, it ends up sweeping under the rug the intrusion of the vision of the good defined by technology. Liberal democracy denies us a vision of the man behind the curtain because it is so damaging to the purity of the theory. Think about even basic structures in our society like roads or television. It could be argued that networks such as these are value-neutral, mere equality-and-opportunity-producing mechanisms—a road being built does not force you to drive on it! On the other hand, as Borgmann puts it, “a mountain valley split by a road is no longer a place for solitary hiking” (96). The point isn’t that roads are bad, it’s that it is disingenuous to assert that even basic infrastructure is “mere” means, and doesn’t arrogate itself as an end. It does, even if by just restricting the kinds of life available to us! The systems of our society may be indifferent when it comes to how we consume commodities, but they don’t really give us the option of not engaging with commodities in the first place. Ultimately, Borgmann wants to bring a discussion of this hidden pattern out into the open. It is only once we have acknowledged that we all come to the table with ideas about the public, shared good life (whether we like it or not) that we can have a productive conversation in the political arena about issues more substantial than the continued production of commodities. Next up: we move from theory to practice and look at how people in our society have in fact come to terms with the technological paradigm. Deep points Borgmann’s making here – great to see the careful explication. We engage technology to maintain a liberal democracy and not just only as a tool of a capitalist market society. Liberal democracy succeeded because we gave up on the idea of a truly egalitarian society. Technology can serve to help narrow the gap of inequality. As such, the liberal democracy is enacted as technology. A policy of economic growth promotes mindless labor and mindless leisure. Ultimately, we have to find the patterns of technology and how these shape our agendas and discourses around the good life. Work towards rational communicative action, not just the production of labor. This was a difficult chapter for me as well. I may have not understood it completely, particular because I’m not a political scientist. But it was striking how the paradigm of technology and the tenets of liberal democracy go together in this unique way, where the political system becomes this ‘meta-device’. The consequence is total stalemate of political discourse, leaving society vulnerable to the hidden operation of the paradigm itself outside of what’s good for society.